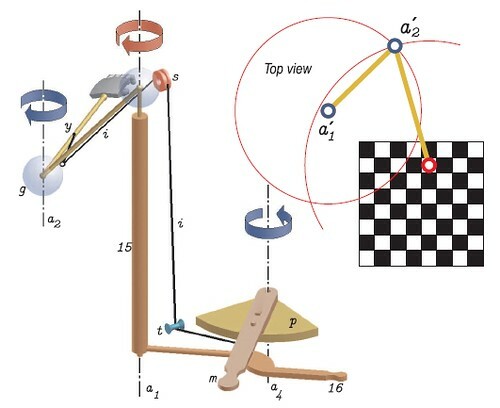 to be met with in the different accounts of mathematical recreations." 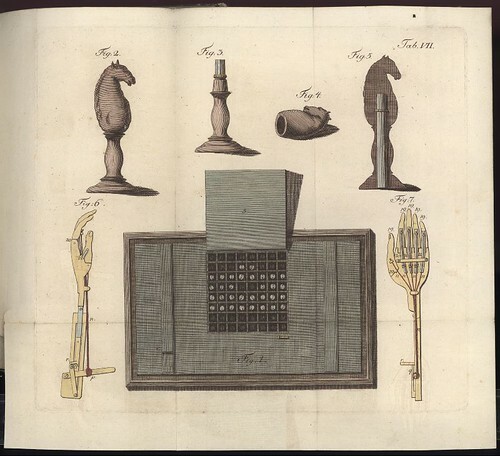 To impress the Austrian Court of Empress Maria, the Hungarian polymath, Wolfgang von Kempelen, designed an ingenious chess playing mechanical device in 1770. 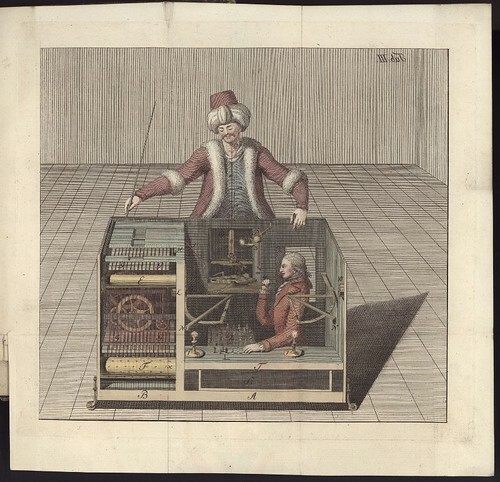 The machine consisted of a cabinet with a chess board on top, doors that concealed brass cogs and gears, with a carved torso dressed up like a Turkish man attached to the back of the construction as it faced the audience. One of the turban wearing dummy's arms was moveable and the hand was of course able to pick up and move the chess pieces. 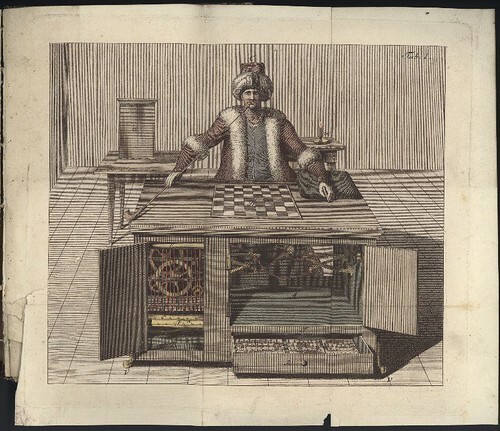 It came to be known as 'the Turk' and exhibition chess matches against a host of challengers made it one of the most popular and enduring automaton shows of the 18th and 19th centuries. 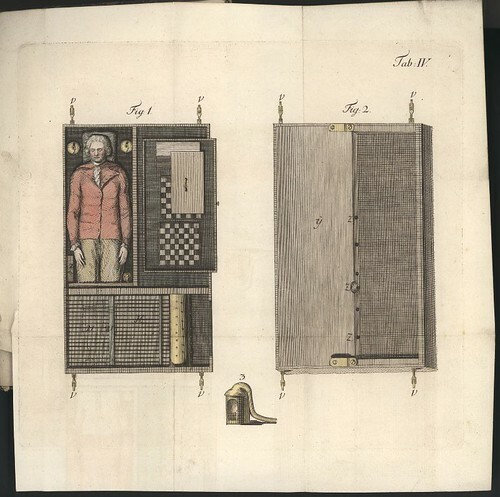 The internal design included false clockwork pieces that moved in concert with the hidden operator's (a chess master) seat movement and helped him stay concealed - he moved around to avoid detection when the host (Kempelen in the beginning) opened doors and invited the audience to peer through to the other side - creating the illusion of a humanless automaton. Magnetic chess pieces allowed the board layout to be seen by a simple reciprocal system inside; ventilation pipes provided air for the operator and other pipes diverted candle smoke out through the Turk (who also smoked a pipe). A pegboard laid out the chessboard inside the cabinet and pantographic controls (a dual, fixed movement system, often used for drawing - see computer schematic above) worked the arm and hand on the main chessboard, moving chess pieces around as pegs were moved inside by the chess master/operator. There is more to it obviously but this was the basic set-up. 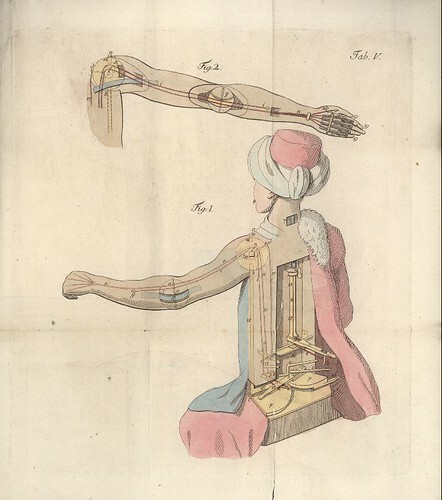 After its debut before royalty, the device took a back seat in Kempelen's life and it wasn't until the 1780s that he was persuaded to take the Turk on a tour of Europe. 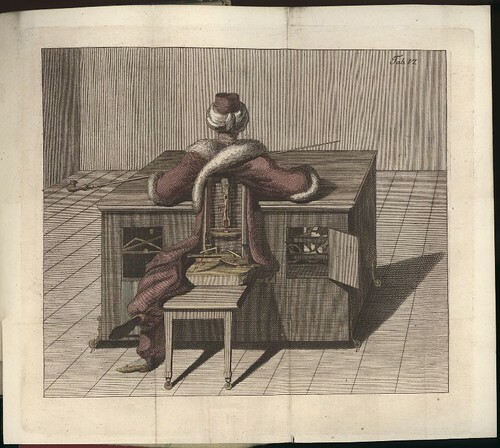 A succession of opponents (including chess champions and the likes of Benjamin Franklin) vied for the opportunity to play the increasingly popular magical machine. 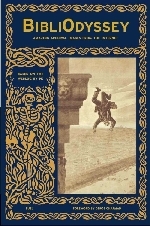 As might be expected, skeptics emerged and there were at least a couple of books (the illustrations above are from one of these) that claimed to explain the illusion. Kempelen retired the device before the end of the decade, and in 1808, the Turk was brought back into service under a new (and fairly mercenary) master, Johann Mälzel. He would attract the Turk's most famous opponent, Napoleon Bonaparte, who, from varied accounts, was said to have been defeated once because of illegal moves and again when he laid down his King. Many more exhibitions followed, as did profits, bankruptcy, tours of America and Cuba and eventually, while in semi-retirement, the Turk was destroyed in a fire in Philadelphia 1854. There is a wealth of material to read online about all of this but wikipedia is probably the best resource - it's a very detailed article. 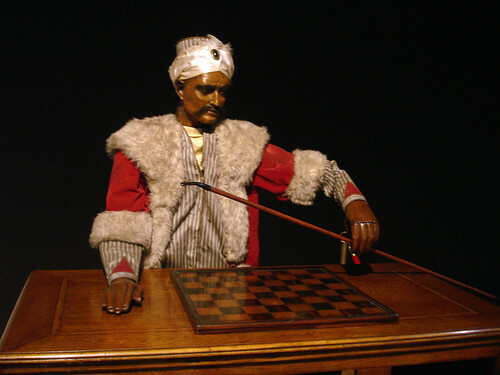 The photograph of the Turk (courtesy of Marc Wathieu) is from an exhibition on the automaton from this year. There is a fairly good website associated with the event. Chessbase have some alternative illustrations plus a number of photographs from a rebuilt modern version of the Turk (Ernst Strouhal from a Vienna Arts University was also involved here). All this Turk palaver above was in fact just an elaborate hoax on my part to introduce the very extensive and equally impressive natural history collection pilot project from the Humboldt University in Germany. Die Wissenschaftlichen Sammlungen is one of those collections where it is absolutely worth spending a bit of time. 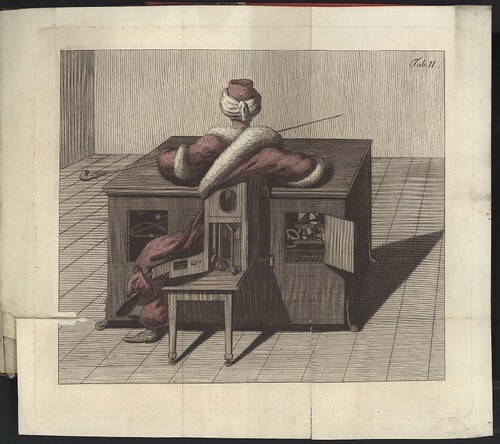 From what I gather, this means "Of Mr. von Kempelen's chess player and its recreation, in the sense of giving instructions to recreate the machine...but I might be wrong, as I do not know the book at all. Oh you're probably right. I have this quaint habit of using a translator and then applying the 'wishful guessing' technique - it gives me the illusion of being multilingual; whereas, after reading this entry again, it's fairly obvious I should just concentrate my energies on getting the actual english parts right. This is so fun to see spelled out in such detail! Wonderful find! Comments are all moderated so don't waste your time spamming: they will never show up. If you include ANY links that aren't pertinent to the blog post or discussion they will be deleted and a rash will break out in your underwear. Also: please play the ball and not the person.